The Piasecki H-21 Workhorse (aka Shawnee, CH-21C) was a product of the legendary helicopter designer Frank N. Piasecki. It was designed and built by Piasecki Helicopter, the company that would later become Boeing Vertol. Like the Piasecki HRP-1, the H-21 was commonly known as the “Flying Banana”. It holds the distinction of being the first helicopter to cross the US nonstop, with the help of inflight refueling. This multi-mission helicopter was a direct result of and successor to the HRP-1 Rescuer, which saw success in military use as the first significant transport and rescue helicopter in service. The initial design goal of the H-21 was to be an Arctic rescue craft. Which is why it possesses winterization features that allow it to operate in temperatures as low as -65 degrees Fahrenheit or -54 degrees Celsius. The Workhorse was first proposed to the US Navy by Piasecki in 1949 as the YH-21. It represented an all-metal evolution of the wood and canvas HRP-1. It was a tandem-rotor helicopter with a single powerful engine. In the case of the CH-21C, which is the main US Army variant, that engine was the Wright R-1820-103 radial engine, which produced 1 425 horsepower (1 063 kW) compared to the HRP-1’s 600 horsepower unit. The H-21 represented a significant upgrade to the HRP-1’s payload capacity. This helicopter could transport 22 fully-equipped infantrymen or 12 medical litters and two medical attendants. In service of its multi-mission nature the Workhorse could be equipped with wheels, skis or floats. The Workhorse’s many variants saw service all over the world. This included service in the Royal Canadian Air Force, French military, German army, Japanese SDF, Swedish Navy and both US military and civil service. The Workhorse notably took part in the Algerian War in service of the French, including versions that were armed with forward-firing rockets and machine guns. However, in practice the Workhorse proved unsuitable for ground attack roles. In the United States Army, the Workhorse in its various incarnations had an extensive service role. It was retired in 1967 after production ceased in 1959. 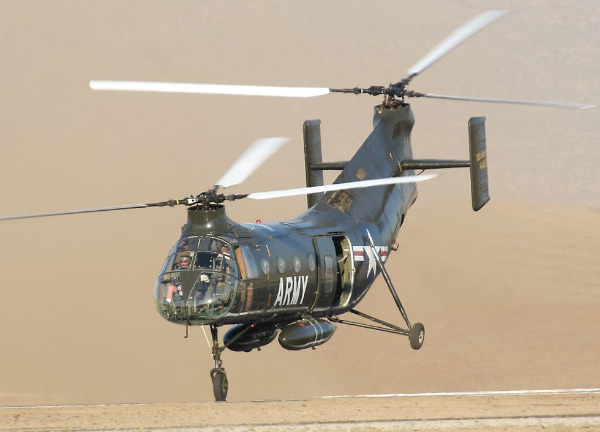 Do you want to comment the Piasecki H-21 Workhorse / Shawnee / CH-21C helicopter?